eastern section called the Duchy of Prussia. economically and became a part of the German Empire in 1871.
areas of Eupen and Malmedy that had been a part of Prussia were annexed by Belgium. country, he was forced to abdicate and his son, Baudouin, became King. King and replaced it with a sign displaying the skull and crossbones. To the present day, and as far as we know there has only ever been two more public houses named King of the Belgians, one was in East Street - Bridport, Dorset where the premises took on the name in 1915, it remained with this name until 1940 when for reasons unknown to us it changed its name to The Lord Nelson, the other was in Leander Drive, Gravesend, Kent, bearing the name from 1914 until May 1960 when it was changed to "The Gravesend Boat" thus rendering the King of the Belgians Huntingdon unique in both name and character. solid oak beams and a copper topped bar, the public bar ceiling and back of the door are covered in aviation stickers, a legacy from the 70s & 80s when the American airbase USAF Alconbury was just up the road, the base is used mainly as offices now although the runway is still intact, in good working order and is one of the longest runways in Great Britain. Over the years the pub has been a firm favorite with visitors from all four corners of the world, many of whom make a special journey to Huntingdon just to re-visit the pub whilst in the UK and will of course always receive the warmest of welcomes. development was concerned then sold the premises to businessman Peter Reynolds. 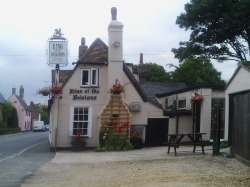 As of early 2010 the lease & licence for the King of the Belgians was acquired by the then live in managers "Diana and Nathan" who then ran the establishment as their own leasehold business until May 2012.
daughter Jane Spicer, Jim and Bernie had already succsessfully run the pub as managers in the 1980s.